The rich need to learn to live more simply, so that the poor may simply live." Item 1 updates and links to Bart Jordan's 1997 article in the British Science publication, the "Moons of Mars." This item includes information to why these moons are really asteroids and what is behind the mysteries of the Mars Cydonia region, the "Face on Mars" and the mysterious "chevron" on Miranda, in the orbit of Uranus. Bart Jordan is bringing the Greek legends to life in a way that has been guiding NASA for years, though they are secretly discrediting him and his sources of information from ancient literature. There is much to this story; we will continue to provide updates. Thanks to the Millennium Group for posting the Moons of Mars article. This next item was in the first item position when originally sent out. Jennifer Harbury has been an attorney for Leonard Peltier, and a beloved human rights activist, the author of her account: "Searching for Everardo." We are forwarding her communication seeking help in calling the Guatemalan Embassy to safeguard her family and herself. Item 3 includes various links to recent articles, including on the license for the CIA to be the judge, jury, and executioner, to anyone, in the war for terrorism. Item 4 updates the ever turning events in Venezuela, a young democracy with substantial oil reserves is a dangerous mix. Item 5 is on what to do if the FBI contacts you. Bart Jordan worked anonymously for years consulting NASA on various space missions, including Gemini and Apollo missions, using information from ancient languages. Thus, Phobos and Deimos were discovered, but are they moons, or asteroids which were placed into orbit by an advanced ancient civilization? This article was originally published by QUEST For Knowledge (a British science publication) in 1997. Bart Jordan said that in 1944 at age seven he calculated the distances of the moons Phobos and Deimos from the center of Mars. (These figures were published in the Encyclopedia Britannica during the 1960's, before NASA had such records.) Bart Jordan met Ernest O. Lawrence, the Nobel prize physicist, in the early summer of 1945 (at eight years of age) to whom he gave a thirty-five-page paper entitled: Ares [Mars], Phobos, Harmonia [Miranda], Deimos, Aphrodite [Venus], and Comet [Haley]. Two years later at Lawrence's urging, Jordan met with Albert Einstein to discuss the content of his paper and its supportive data. By way of introduction to a brief article by Jordan in Early America Revisited, Dr. Ivan Van Sertima states: "Bart Jordan was a child prodigy to whom Einstein granted special audience because of his phenomenal mathematical abilities." Bart Jordan contacted Jonathan Mark from a press release he had received about the high risk (plutonium) Cassini Earth flyby in August 1999. Bart Jordan has nurtured a tremendously wide-ranging, diverse, yet interrelated, combination of skills that has allowed him to uncover, perhaps, the discovery of our times. He is highly gifted in metrology (the art and precision of measuring), he understands some 17 languages, many of them ancient varieties, he is a former concert classical string performer, often using ancient instruments, his friend and mentor was the renown classical guitarist, Andres Segovia; Bart is also an artist, an astronomer, and an anthropologist. This summer Harry Jordan (not blood-related to Bart) wrote Flyby News that he was planning to present an overlay with survey drawings completed on the Mars' Cydonia region that demonstrate Bart Jordan's accuracy in mapping this area with the latest NASA Surveyor images at an International Conference. See this following URL page for a November, 2000 article on this by Harry Jordan, which includes a link to his bio. 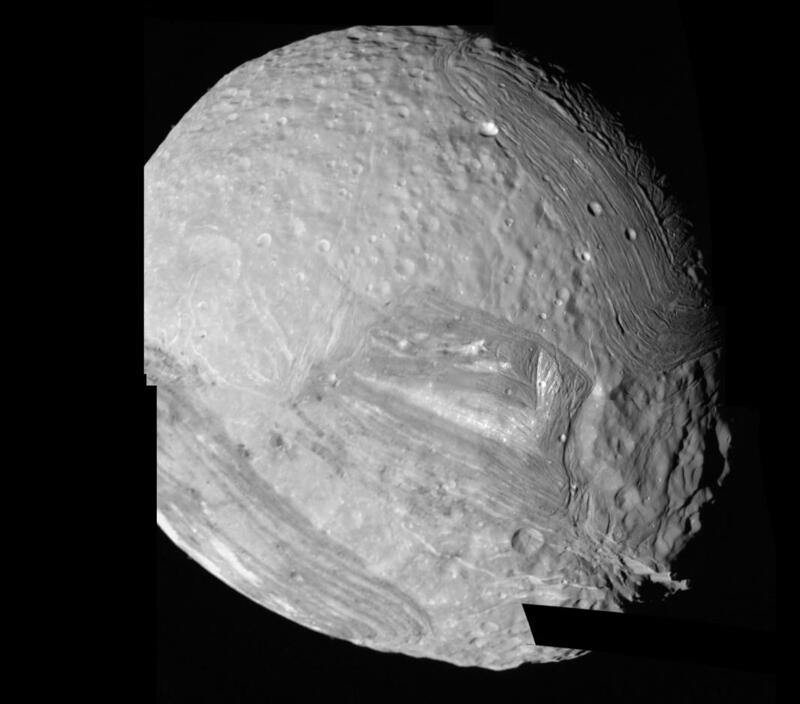 Besides Mars, Bart Jordan said he provided information to Dr. Kuiper that led him to discover the 5th moon of Uranus. As a balance for Phobos and Deimos, the ancient Greek literature directed Bart Jordan to calculations from the name, "Harmonia." Yet, instead of Harmonia, they changed the name to Miranda, (a character from Shakespeare) and according to Jordan, began a campaign to discredit him and the truth that could awaken humankind to a wondrous past that could provide guidance for a future. I am writing to ask you for your emergency calls for protection for my family down in Guatemala. All three of my sisters in law have been threatened and one was badly battered a few days ago in front of her small children. She is now in hiding with her entire family. I am leaving for Guatemala in a day or so to see work with the MINUGUA team and other human rights groups; and to lodge my formal protest with the government. The army knows everyone is getting ready to leave for the holidays, and they are testing the waters to see what they can get away with in terms of retaliation against my family. They also hope that given the Sept. 11 backlash, that they can do whatever they please nowadays. All this is happening because they are up against the deadline the Inter American Court gave them for complying with the reparations order in Everardo's case, and they are very, very angry. I fear that someone is going to be killed or badly hurt if there is not an immediate and powerful response from all of us. Has not the Bamaca family suffered enough? Ironically, all of this started with what appeared to be a startling victory. A few weeks ago, Copredeh ,( the government's defense lawyers in the case), called us to say that the government was willing to pay the money damages award ordered by the Inter-American Court. We were all astounded by this news, needless to say. I have always assumed that it would take me twenty years to get this particular government to comply in this particular case. The Court, of course, had also ordered that Everardo's body be returned to me, and that the Court's findings and fact and law about what really happened be published in the main Guatemalan newspapers. But when we asked about these portions of the order, we were told that there was no time for discussion about these issues. The Copredeh people also insisted that I arrive in Guatemala at once to sign the papers, and that there should be no publicity. This caused some obvious concern, but I did go down, and met with both the family and Copredeh lawyers. We decided that for the sake of the family's safety, we would keep all this secret until they could move to a more protected area. We were, frankly, all amazed when the funds were actually transferred later that week. The Guatemalan government has paid the damages in Everardo's case. Unfortunately, they are evidently now bent on making us pay too. Some of the reprisals began even before we had heard from the government. Several months ago, my sister in law Alberta Velasquez, Efrain's half sister, reported several disturbing incidents. She and her family had fled from the remote finca where they grew up as a result of the army repression in the area. They have lived quietly in a small barrio in the Capital until recently. Then the neighbors began to report that armed men were looking for her husband and asking where he lived. Friends told her son that he should hide, that a car with black glass windows was circling the area, and had asked where he lived. The car was full of armed men. Strangers she had never seen before began speaking loudly in the streets about the Bamaca case, swearing they would kill any relatives if they ever found them. She and her family once again fled their home, and are now in a new location. When I was in Guatemala two weeks ago, I learned that my other sister in law, Josefina Bamaca Velasquez, had also fled her home as well, over a month ago. Armed men had broken into her small hut on the remote finca where she still lived, terrifying her, and searching everywhere, for what she did not know. Needless to say, a robbery by a large group of well armed men in a tiny and impoverished peasant community is very unusual, given that the residents would have virtually nothing to steal. Such assaults have traditionally been politically motivated and carried out by the army or other state security sectors. On Wednesday, December 11, my sister in law Egidia Bamaca Velasquez was attacked in her home in a small barrio just outside of Malacatan. Six well armed men wearing ski masks, and bearing guns and machetes entered her house and beat her in front of her children, threatening to kill her. This is a very tiny and frail woman who suffered from severe malnutrition for most of her life. The style of the attack is very much that of the military. Once again they tore up the house, searching for something, and lamenting that they had not found it. I presume they were searching for her bank book, intending to take away the very funds they had just been forced to pay in reparations. Obviously, the military is furious and also mortified by the payment of the reparation portion of the award and now intends to seek "vengeance". They know that the best way to hurt me is to hurt the family. They also wouldn't mind if a "common criminal" kidnaped someone to take the money back, or killed someone to "teach me a lesson". I have now met most of my 21 nieces and nephews, from baby Everardo, two years old, to the young adults. It would be difficult for me to imagine a brighter, more talented group of young Mayans, and I am so pleased to think that my share of the reparations award will send each and every one of them to the University. ( I signed years ago to give all of my share to the new generation and will honor that commitment.) If they live. I could , of course, try to bring them here, and will do so if they wish. But exile was not part of the Court's concept of justice in this case; and Guatemala has already lost three generations of its best and brightest, either to the death squads or as refugees. This has to end. I will, as I say, be leaving for Guatemala either Monday or Tuesday. I have notified some Congressional offices, but remain concerned that the army may try to arrest me or charge me with "illegal speech", as they have been doing with so many other human rights leaders recently. It is the new fashion to bring charges for criminal defamation, incitement to riot, or even treason….as we have seen in the cases of Rigoberta Menchu, Rosario Pu, Bruce Harris, and many others. We have already notified the Court that the family needs protection at once. However, your calls to the Guatemalan Embassy, as of early Monday morning and throughout this week, are the most important of all. The government needs to know that this case has not been forgotten, and that our own commitment to human rights for all people is as strong as ever. They are waiting to evaluate our response. Your calls will keep people alive over the Christmas holidays, quite literally. PLEASE CALL OR WRITE THE GUATEMALAN EMBASSY AT ONCE. 1. Please tell the Guatemalan government that we will not tolerate acts of state terrorism and reprisals against any persons seeking justice. 2. We demand guarantees of safety for all members of the Bamaca family. 3. We demand safe passage for Jennifer Harbury while she seeks to protect her family. 4. Should there be further actions of this nature, we will ask our Congresspersons to move for the extradition of military officers implicated in the drug trade in Guatemala. 5. If this is how Guatemala respects the international judicial system, we will start up a campaign to have Guatemala expelled from the OAS. THANK YOU, EVERYONE FOR YOUR MANY YEARS OF SOLIDARITY AND SUPPORT. "...follow all facts, wherever they lead...."
How did Iraq get its weapons? We sold them. We should view the Prestige oil spill not as a fluke or a one-time accident. It's our future, made more likely by our reliance on crude oil. (CNSNews.com) - President Bush Monday named former New Jersey Governor Thomas Kean to replace Henry Kissinger as chairman of the commission investigating the intelligence failures prior to the Sept. 11, 2001 terrorist attacks. Friday's desperate maneuver by U.S. President George W. Bush – his cynical call for "early elections" in Venezuela, a country that has had six national elections in the past four years – has backfired after it was revealed as unconstitutional. "Early elections, in the sense that of course, there is a referenda (sic) that can be held earlier that is a reflection of the manifestation of the will of the people and this is the process that is anticipated in the Venezuelan constitution," Fleischer told reporters earlier today. - Stores are open for business now even in the wealthy areas of Eastern Caracas, the last bastion of "The Strike that Wasn't:"
- 90 percent of all contract employees of the oil industry are back at work, now that the executives who locked them out have been removed. Read also, in our report today, about the machinations within the Organization of American States, as we name the names of which countries' leaders have lined up with the coup plotters, which have been strongest for democracy, and which have broken from the United States position in recent hours. Read also from the transcript of White House correspondents grilling Ari Fleischer on his false claims made last Friday regarding the Venezuela Constitution. Also, WELCOME BACK to Charlie Hardy and his columns on Vheadline (we quote his analysis of the "Grinch-osition" in Venezuela and link to today's column). These stories and more are now posted at Narco News. * Tell the officer you want to consult an attorney before deciding what to do. Telling the officer that you need to speak to an attorney before answering any questions is legal and appropriate. If you want to talk to the FBI, INS, or police, your attorney can contact them for the interview on your behalf. * ANY information you give to an officer without an attorney, even if it seems harmless, can be used against you or someone else. Lying to an officer is a separate crime. Remaining silent is your right. * You are not required to allow the officer into your home or office without a warrant. Ask to see the warrant. However, do not obstruct an officer who refuses to show you a warrant and forces his or her way into your home or office. Tell the officer that he or she does not have your permission to enter. * You have a right to see the warrant. You must go with the officer, but you do not have to answer questions until you consult an attorney. * If you are detained, you should ask for an attorney and remain silent. If you are detained in an immigration detention center, ask for contact information for attorneys. You also have a right to call your embassy. Tip: If the FBI, INS, local police or other law enforcement contact you, write down the name, agency, and telephone number of the officer who calls or visits you. Then CONTACT AN ATTORNEY IMMEDIATELY. 800-954-0254, http://www.aila.org ; click on "Need a Lawyer?"